The concept of the medallion began in biblical days as a symbol of authority. During the Middle Ages, the medallion signified membership in religious orders and guilds, and later in elite orders of knighthood or government office. It is customary for medallions to be struck for university chancellors and presidents to wear at commencement and other academic events that require regalia. 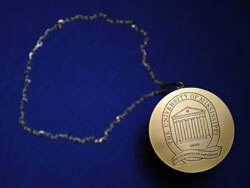 The University Medallion symbolizes the authority that the Board of Trustees entrusts to the chancellor of the University of Mississippi. The medallion was designed in 1968 for presentation at the inauguration of Chancellor Porter Fortune Jr. Intended to be worn by all future chancellors, the medallion was used by chancellors R. Gerald Turner and Robert C. Khayat before being passed to Chancellor Daniel W. Jones in 2010. The face of the medallion bears the Great Seal of the University of Mississippi. The back of the medallion bears the university’s official crest. Both sides display the opening year of the university, 1848. The chain signifies the links that bind the chancellor to faculty, staff, students and alumni. The official University Crest was designed in 1965 to symbolize all university units and activities. It features the columns of the Lyceum surrounded by the words “The University of Mississippi.” The University Motto, “Pro Scientia et Sapientia” (in behalf of knowledge and wisdom), is written on a ribbon at the base of the crest, and the university’s opening year, 1848, appears between the Lyceum columns and the motto. Design sketches for the crest were created by Mrs. Don Vaughan at the request of a committee chaired by Dr. A.B. Custy with Dean Victor Coulter, Mae Fortenberry and Dr. J.R. Tatum as members. The Latin inscription was recommended by Evelyn Lee Way from a list of 17 possible phrases suggested by William Hoyt Cook, visiting professor of Greek and Latin, for the University Motto. Although Ralph Langreck of Benson Printing Co. was the artist involved in refining the design, Robert Samuels of S.C. Toof & Co. of Memphis, Tennessee, oversaw preparation of the finished artwork and printing, and mailed the first 35 prints of the crest to the university in August 1965. With the creation of the crest, administrators established the policy that the university’s great seal would be used only on official documents. S.C. Toof assisted in registering as official university service marks both the crest and the great seal. A simplified version of the crest, with only the Lyceum columns and 1848, was developed in recent years for use on stationery, business cards and other everyday uses. The key is an ancient symbol of ownership, representing the responsibility of stewardship for university resources, both human and material. The University of Mississippi Key was designed and executed by James Ronald Bartlett, professor emeritus of modern languages. The key is similar in general design and size to the key presented to the Deputy Lord Mayor of Oxford, England, at the city of Oxford’s sesquicentennial celebration in 1987. The University of Mississippi Key incorporates a design of the Lyceum on one side and the Great Seal of the University of Mississippi on the reverse side. Wreaths of laurel are clustered along both sides of the grip as symbols of the honor and dignity valued by faculty, staff, students and alumni. Inscriptions along the shaft signify past and future generations of the university. In the Middle Ages, ceremonial maces were carried by bodyguards of French and English monarchs. Later, the mace became an important symbol of office in both civil and academic processions. Many American universities have maces that have been designed to reflect the unique character and values of the institution. The University of Mississippi Mace was designed in 1996 by Ron Dale, professor of art, and Gregory Shelnutt, associate professor of art. It was constructed by them with the assistance of Russell Pinion of the Physical Plant Department and was first presented to Chancellor Robert C. Khayat at his investiture. 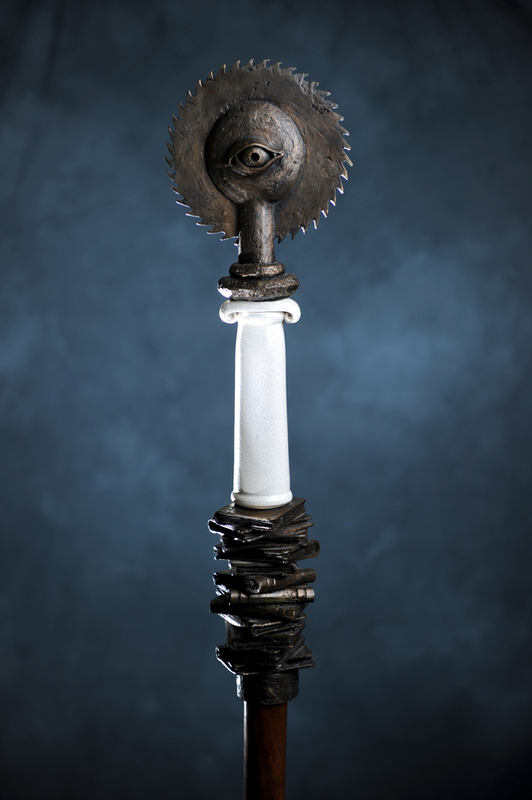 The mace is topped by a bronze symbolic sun revolving around the Eye of Wisdom. 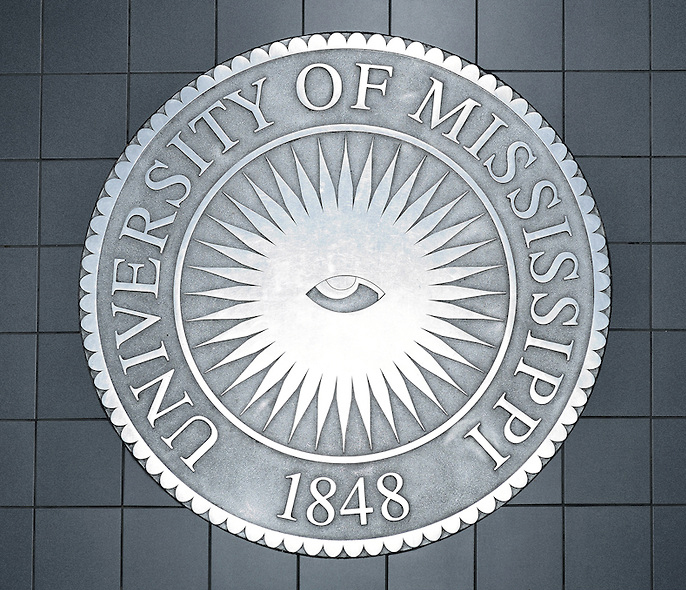 This image is derived from the Great Seal of the University of Mississippi. The sun is traditionally associated symbolically with kings, paternal authority, worldly status, fame, victory, life force and force of will. The eye is associated symbolically with light and intellectual perspicacity. The sun rests on an Ionic column made of porcelain. The column represents the structure of a strong community or institution and reflects the Greek Revival architecture of the Lyceum. The column stands on a stack of bronze books arranged in a spiral representing stairs, which symbolize emotional and spiritual development and the gradual acquisition of wisdom and knowledge. The staff of the mace is made of native walnut, turned to a taper and finished with a bronze tip. Dating from the earliest days of the university, the Great Seal is the university’s oldest institutional symbol. The design adopted by the Board of Trustees in January 1845 called for “the words ‘University of Mississippi,’ engraved around the margin, with an Eye in the centre.” University historian Allen Cabaniss noted that the eye, representing learning, is an obvious Masonic influence; three members of the committee that designed the seal were Masons. The eye is surrounded by a representation of the sun. Early versions of the seal sometimes included the word “Oxford,” but that was replaced in the 1930s by “1848,” the year the university opened. Since 1965, the Great Seal of the University has been reserved only for contracts, diplomas and other formal uses. A time-honored tradition of great dignity, the wearing of academic apparel is a survival of the ecclesiastical garb of the late Middle Ages, in turn a survival of still earlier civilian fashions. The academic gown, necessary for a scholar’s warmth, and the hood to protect his tonsured head were apparently first regularly adopted in the 13th century at the University of Cambridge (1294), soon followed by the University of Oxford. The custom was transplanted to this country in colonial times by Kings College in New York, now Columbia University. In 1895, American universities and colleges decided to standardize their academic styles and developed the intercollegiate code of academic custom that, in general, follows the Cambridge tradition. The three characteristic elements of academic regalia are the gown, hood and cap. The gown is usually of black material (worsted serge for bachelors, the same or silk for masters and silk for doctors). The doctors’ dress gowns of the chief British universities are scarlet. Bachelors’ gowns have pointed sleeves; masters’ have long, closed sleeves, lunate at the bottom, with slits at the elbow from which the arms protrude; the doctors’ have wide, round, open sleeves. Doctors’ gowns are faced with panels of velvet down the front and three bars of velvet across each sleeve. The hood, worn around the neck to hang down the back, is the principal emblem of the nature and source of the degree held. It is edged with velvet of the colors of the degree, while its silk lining bears the colors of the institution that granted the degree. Bachelors’ hoods are 3 feet long, masters’ 3½ feet, and doctors’ hoods have only wide panels at the sides. Hoods may be worn only after the degree has been granted. The cap – the square mortarboard in American universities but a round, soft, flat velvet hat in British, Canadian and some European universities – bears a tassel that may be black for all ranks and degrees or may be of gold thread for doctors and the color of the degree for bachelors and masters. The doctors’ caps only may be made of velvet. The degree colors are appropriate to the category of the degree rather than to the scholar’s major subject. For example, the appropriate color for degrees in arts and letters (B.A., M.A., B.Lit.) is white; in commerce, sapphire; in dentistry, lilac; in education, light blue; in engineering, orange; in the fine arts, brown; in humanities, crimson; in law, purple; in library science, lemon; in medicine, green; in music, pink; in pharmacy, olive; in philosophy (Ph.D.), dark blue; in physical education, sage; in science, golden yellow; in theology, scarlet. These colors are used for the edgings of all hoods and may be used for the velvet facing and sleeve bars of doctors’ gowns and tassels on bachelors’ and masters’ caps. The institutional colors, with which hoods are lined, indicate the university or college granted the degree. Among the hoods worn by our faculty members are those for Alabama, crimson and white; Arkansas, red and white; Auburn, orange with two navy chevrons; Boston, scarlet with white chevron; Cambridge (England), scarlet; Chicago, maroon; Columbia, light blue with white chevron; Duke, royal blue with white chevron; Emory, navy blue with gold chevron; Harvard, crimson; Illinois, navy blue with two orange chevrons; Indiana, crimson with white chevrons; Iowa, old gold; Johns Hopkins, black with gold chevron; Kansas, navy blue with cardinal chevron; Kentucky, azure blue with white chevron; Louisiana State, purple with old gold, party-per-chevron; Michigan, maize with azure blue chevron; Mississippi State, maroon chevron on white; Missouri, old gold with two black chevrons; New York, violet; North Carolina, light blue with two white chevrons; Northwestern, purple with gold chevrons; Ohio State, scarlet with silver gray chevron; Oxford (England), light blue edged with white fur; Pennsylvania State, navy blue and white; Princeton, orange with black chevron; Purdue, black with two gold chevrons; Rice, silver above blue; Rochester, dandelion yellow; Rutgers, scarlet; Stanford, cardinal; Tennessee, white with orange chevrons; Texas, white above orange, party-per-chevron; Texas A&M, white chevron on maroon; Vanderbilt, black and gold; Virginia, navy blue with orange chevron; Wisconsin, bright red; Yale, royal Yale blue. The colors of the University of Mississippi are a blue chevron on a field of red. They were introduced by Professor Alexander Lee Bondurant in 1893.